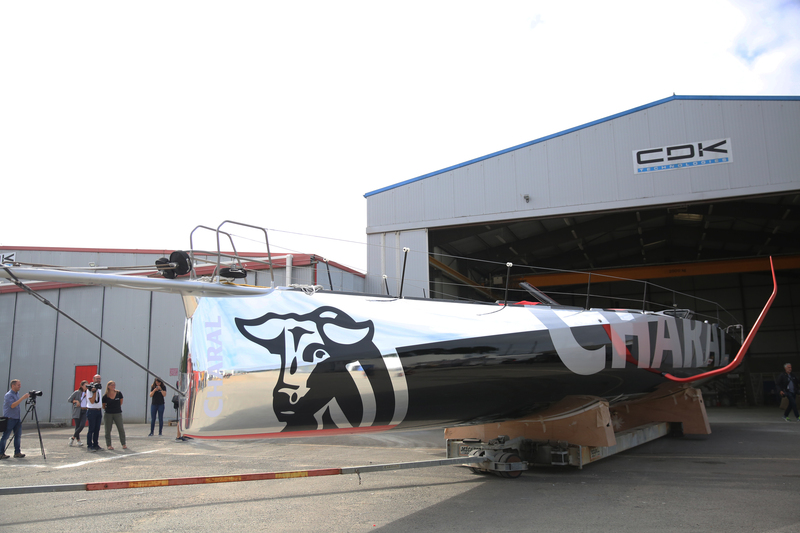 Inch by inch and with the greates care in the world, the sailing boat CHARAL IMOCA 60 was delivered by CDK Technolgies boatyard in Port-la-Forêt, France. 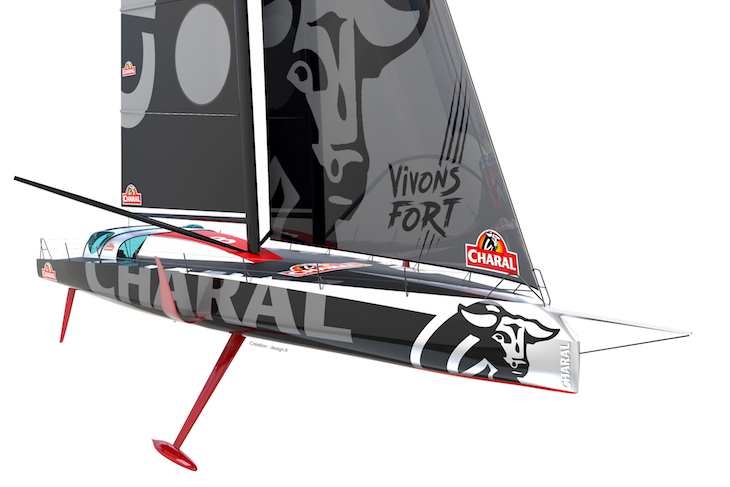 For months Jérémie Beyou and Pierre-François Dargnies, technical directors for the Charal Sailing Team, have been promising that the day the IMOCA 60 CHARAL would be a surprise when unveiled. And it certainly was: with its massive wide and long foils, the monohull looks almost like a multihull, with a warship-like bow and rounded transom. Jérémie Beyou, en route to compete in the Vendée Globe for a fourth time, sees this as the culmination of “joint consultations and seeing our ideas take shape. Suddenly, with all the pieces assembled, the boat comes to life”. For the skipper from Brittany, who came third in the 2016/2017 edition of the Vendée Globe, the boat is the result of personal investment, great experience over the years and the work of a group of people who have listened to Jérémie and who have also known when to challenge him when needed. From the architects drawing boards to those who have sanded the carbon, a whole chain of skills and knowledge has been put in place and allowed for the boat to see the light of day. Jérémie Beyou: “We chose to make foils that are strong to get a maximum power and lift (for the foiling effect). The shaft is very long as is the tip and has a double surface and angled elbow, which highlights the visual impact. They are reasonably thick too, because we are going to put quite a lot of arching pressure on the tips. If the boat appears really wide, it is because we can’t raise both foils at the same time: one will always be lowered”. Jéremie Beyou: “All that supports important loads – the rig, the appendages – has sensors with optic fibre sending back information in real time to my navigation console to then be treated by software that gives me the right reading of the situation. However, unlike the F1 or the Ultime, this information is not relayed to shore. I am the only one who can access this and therefore am then able to act manually as needed”. March 2018 – Releasing the hull from the mould. “It’s the big reveal. Back in March, we discovered what Charal’s hull looks like from the outside. That moment in time is a very important stage for the whole of the CDK team. At that point were revealed the two main characteristics of this boat: a honed shape and a perfect hull below the waterline, that together guarantee a great performance level. May 2018 – Charal’s hull and deck are assembled to form one. Capucine Cadiou, engineer within the CDK Technologies design office and in charge of the Charal project: “We all felt very moved by the hull being released from the mould and then when the deck was attached we could finally discover what she looked like with all the different parts assembled. Every stage of the build is as important as the next, however from the point the deck is attached, you can see what the boat looks like”. 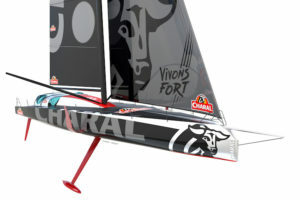 For the naval architects and Vincent Lauriot-Prévost, there is a great deal of satisfaction all round as the model envisaged is totally in line with the original vision: “The monohull Charal, the first IMOCA of the foiling generation to be launched today, is the result of a completely new approach with regards its general concept, together with and innovative structure and implementation. Through this project, we have been able to enjoy a thoroughly positive collaboration and a real passion for innovation with the teams from CDK Technologies and Charal Sailing Team”. Epilogue, exit from the yard Tuesday 21 August – Yann Dollo: “This build relied on a solid tripod of skill sets, made up of a design office engineer dedicated to the project, Capucine Cadiou, who already has three foiling IMOCAs to her credit, the project manager Michel Ollivier and the Charal Sailing Team. Though it was a fine project to carry out with important requirements on a technical level, it was also a great success on a human level. I’d like to highlight and thank all our team for the work they put into this project. With the schedule divided up by the numerous May holidays, it wasn’t easy to stick to the deadlines. However, CDK’s employees naturally sacrificed their holidays. This team is united and motivated. Being partner to Jérémie Beyou at the time, CHARAL also made what might feel like simple gestures (Charal products), but they were so important for the general cohesion of the team as a whole. Jérémie regularly called in at the yard to monitor progress as well as congratulate, encourage and acknowledge all the work done. This recognition from the partner and the skipper is the best possible reward”.